The American Exchange Indicator Map of Paris. 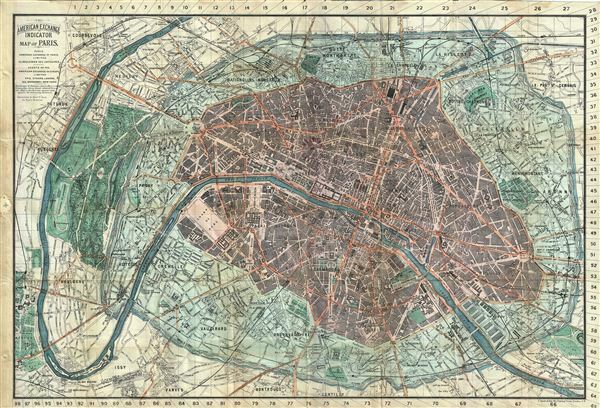 This is a beautiful 1883 folding map of Paris, France issued by the American Exchange in Paris, Limited. Centered on the Seine River, it covers embastilled Paris as contained in the Thiers Wall, and its immediate vicinity, including the Bois de Boulogne and part of the Bois de Vincennes. It reflects the transformation and modernization of Paris under Napoleon III and Georges-Eugene Haussmann. Known in French as the 'Grands Travaux,' Haussmann's redesign of Paris defined it as a modern city, with narrow alleyways and confusing streets replaced by a broad network of grand boulevards, imposing facades, parks, and monuments. The map notes individual streets, monuments, churches, town halls, railways, gardens and palaces. This map was issued in the early 1880s, before the construction of the Eiffel Tower. The map is accompanied by a booklet which includes a street index and a visitor's guide to the public buildings, theaters and places of amusements, as well as a complete list of railway stations. Most maps of Paris from this time are in French, but this particular example by the American Exchange was meant for English and American tourists, and has an English title and information in English. This map was printed by C. Smith and Sons and copyrighted to Henry F. Gillig, who was at the time, the General Manager of the American Exchange in Europe (Limited). Published by the American Exchange in Paris, Limited, 35, Boulevard des Capucines. Very good. Minor wear and toning along original fold lines. Backed with cloth. Minor rip in left margin where map was attached to binder, not extending onto printed area. Overall toning. Minor damp stains near folds. Accompanied by original cardboard binder and booklet. The stamp of the American Exchange is visible on map.